Fall is always an important time as far as video games are concerned, this is the time of year when new hardware typically releases, with the exception of the Switch, along with a lot of big triple A games. This year will be particularly interesting due to Xbox Scorpio. Not only have I been thinking about who will come out on top at E3, but also who will be in a good position to make the most out of the upcoming holiday season. Sony doesn’t have any new hardware coming as far as I know, but we will see some games for the Playstation that we saw at last years E3. Several titles that come to mind are GT Sport, the new God of War, Detroit, and Days Gone. Microsoft of course has the Scorpio new hardware is always a big deal, but they have some big titles as well like, Crackdown 3, Forza 7, Sea of Thieves, and State of Decay 2. The thing thats going to make or break it for both Sony, and Microsoft are how well the games are received, and in the case of Xbox Scorpio what will be the price point for the new console. I think that will be the key for Microsoft, if they price the system at too high of a price I don’t think people will buy it. Sony had this problem when the PS3 first released, I was working at Gamestop at the time, and we didn’t start really selling them until Sony lowered the price. This gave Microsoft a huge advantage since the 360 was cheaper, and we sold a lot more of them at the time. As far as GT Sport goes Sony has a tall order as many consider Forza to be the best racing game on any console at this time, Microsoft has pinned a lot of hope on Sea of Thieves. They have been catching a lot of heat for the lack of exclusive titles as of late so theres a lot riding on this game. As far as Crackdown 3 goes, the last game in the series was not nearly as good as the first which was a surprised hit, so they need to have a good product with the new one. Another big release that comes in early fall, September if everything goes according to plan will be Destiny 2. It’s my understanding that not only will it come out on both platforms, but also PC as well. I’m also hearing that Playstation will get exclusive content, not unlike what happened with the first game, so if I’m a big Destiny fan the PS4 version of the game might be the way to go. God of War will most likely sell well just due to the fact it’s a God of War game, in regards to Days Gone, and Detroit, these are new IP’s, yea they look cool, but the proof will be when they release. I can’t count the number of times I have seen games that look really cool prior to release, and were crap when they came out. So how do you think will come put on top this fall, let us know in the comments. you STILL exist in these comment threads!!! woooow!!! You must be super bored of your life! and you’re still talking about the order!!!? ahahahaha you’re an actual moron! You just need to ask about the 2017 ex-clusives he is playing right now and hell shut his trolly mouth for good! if you cant handle the truth dont read the comments. Isn’t there almost 30 million more PS4 consoles out there? Those game sales are pathetic. Because I’m sure second hand sales of used games are accounted for…..
And these numbers just show that sales are pathetic either way you shake a stick at it…..if you want to say anything. Most certain these numbers aren’t just Xbox games as some of those bad boys are on PC as well….. If you want numbers games then make sure you’re peering though your glasses a bit better..
where are your brick exclusives now? Like you know what MS is actually doing. GTFO! Phil said that Scorpio will launch with new games. Duh! Like you know what MS is actually doing! I know that THOSE games were delayed and canceled! thats why you couldn’t prove me wrong! And I know what PS4 exclusives HAVE BEEN ALREADY RELEASED this year and many that will in the future. Which are more, FAAAR MORE than what MS can show this E3. So you GTFO! just like PS4 said to xbone and ….xbone did! Do you realize how long Quantum Break was delayed for? How about ReCore that was supposed to be out in Spring 2016 got delayed and still turned out to be crap. Oh and Crackdown 3 was announced way back in 2014 and still isn’t out. Where is Scalebound and Fable Legends? Oh right cancelled. Then you have indie exclusives like Cuphead and Below that were announced 3 years or so ago that aren’t out either. Please don’t act like Sony is the only one who has delayed games. At least when they delay games they turn out well. 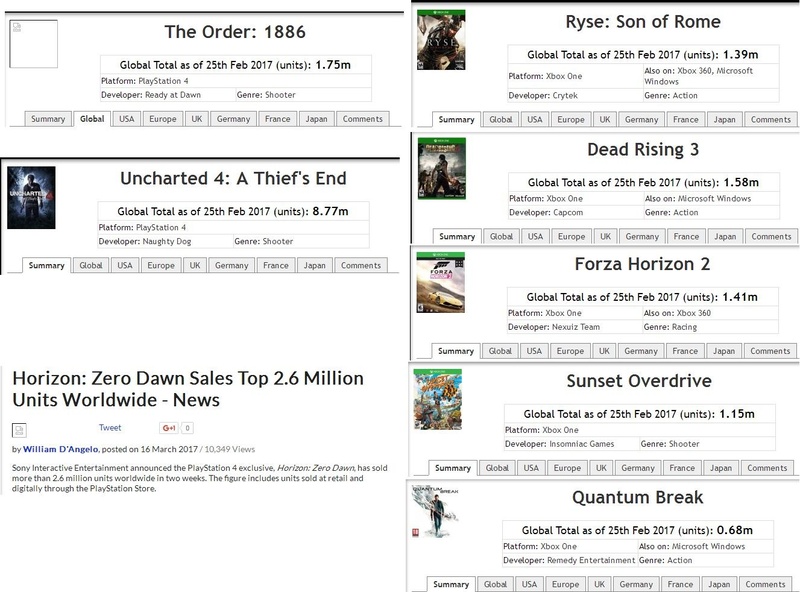 in 2016 alone xbox launched 5 exclusives alone while sony only did uncharted 4. Um your using those alternative facts aren’t you? 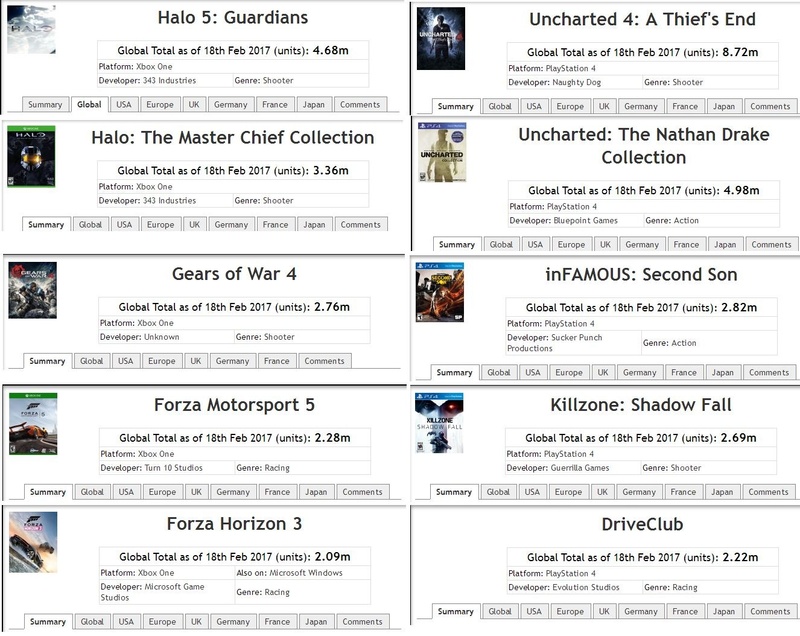 In 2016 Sony released Uncharted 4, MLB The Show 16, Ratchet & Clank, The Last Guardian, Street Fighter V, No Man’s Sky, Shadow of the Beast, Alienation, Bound, and Gravity Rush Remastered. And before you say anything about some of those being developed by studios not owned by Sony don’t forget that ReCore and Quantum Break were the same way. Unlike Microsoft Sony doesn’t wait until the Holiday to release exclusives. Learn what facts are troll. So whats the difference if one company decides to blow their load at the beginning of the year or the end of it? Both are stupid which is why Phil Spencer recently said that he’d like to see Xbox games stretched out through the year more. The difference is that PS4 launched MORE games, more than double! and with better scores by the way. There has to “be” games to stretch anything. How can you state that The Order flopped when it sold better than Xbone’s Ryse: Son of Rome as well as dead Rising 3 / Forza Horizon 2 / Sunset Overdrive / Quantum Break? That’s first I heard about. I’d say there are 3-4 titles max, plus maybe another iteration of Forza. As for the Sea of Thieves, I know this doesn’t really mean anything, but friend of mine got to the closed alpha and as he couldn’t say anything about game (NDA) he simply said that he put his xbox on ebay. Then your friend is, frankly, a moron. I played it. A bit rough around the edges, but I expected that, considering it was an early alpha build. Yes, he’s a moron if he’s making an emotional decision based on something that won’t be ready for months to come. You don’t eat a cake before it has gone in the oven and complain that it tastes bad, logically you don’t do that for a game still in alpha. Maybe he had different expectations? You can see what is the game mechanic and what type of game it is, despite being in alpha stage. We already know The Last of Us Part II gameplay sequence they are going to show, even if it was running on standard PS4, is going to blow away anything Microsoft does at E3 2017. And that isn’t even going near all the other games that will be at it. So yes, yes Sony will be upstaging Xbox at E3 like they have the past 7 years. And seriously, thank you for bringing this up. People getting overexcited about another Crackdown when the 2nd one was basically “Crackdown Undead Nightmare” lol. Set the expectations for something like this incredibly low, that way to may not be disappointed. Showing TLoU 2 gameplay will not blow away the Scorpio no matter how hard you want to imagine it. That’s just fanboy delusion. Well…..software does “sell” a console, so to say that it will not “blow away” the scorpio is correct, but to accept that there actually are games on another console is fact. Throwing around titles is kind of a joke in and of its own. Only way Microsoft could ever “blow ME away” is to actually have some games. And for me the only one I am interested to see is Sea of Thieves, but that is also on “PC”, so not sure if there are truly any “system sellers” this year, or as of late. But yeah I might want to pick up my first 4K blu-ray player, so I laugh at the idea that it quite possibly will be a Scorpio. Just how Sony made that idea happen is laughable by itself. If both companies follow their steps on previous years, Sony’s killer lineup wil be mostly on this half of the year and Microsoft will get the second half. Yes but when you look at what Sony has confirmed for 2017 that doesn’t have dates like Gran Turismo Sport and Uncharted: The Lost Legacy then you clearly see they have games for this Fall. Expect both of those in that time frame. Sony certainly has the games! but they could F..up the timming! This first 3 months have been too good, too crowded, more than one exclusive definetly got hurt by another exclusive. Nobody wants them to F up the timming. Hells no! What Microsoft “big fall”? Hardware with no software does not a “big fall” make. Fail. Both will do well, why do people always have to put MS and Sony against each other in every article, instead why not just focus on the games. You almost did that here but went back in to”click bait” territory by saying who is going to upstage who. Whoever shows good quality games and lots of them for the console IMO will hold the upper hand. Hardware gets loads of public attention while games get people excited so Sony might hold the upper hand as MS have been known to cancel games at E3 this gen while Sony keeps games coming each year. 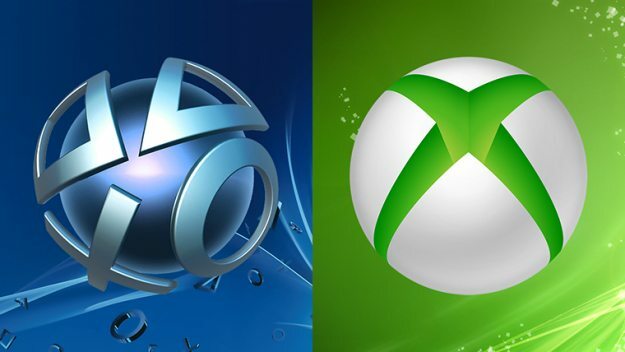 Powerful hardware is great when there’s games to play on the hardware and not possible on other platforms but MS is not releasing games as much as Sony have done with PS4 so really MS needs to step up as all us Xbone gamers are….Still waiting.